The perfect thing for those "hard-to-buy-for" humans and dogs. 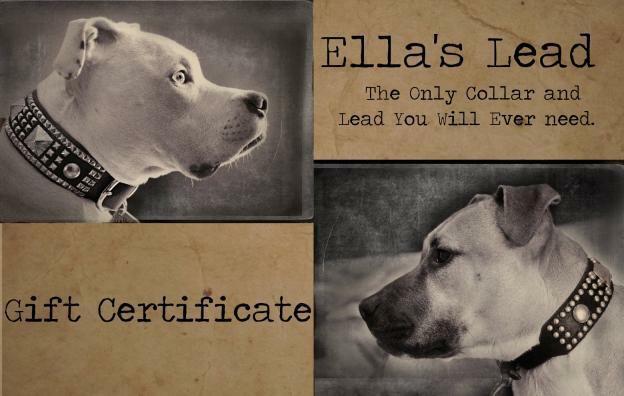 An Ella's Lead gift certificate would make the perfect gift for your favorite humans and dogs. Choose the denomination and we will send you a gift certificate code via email to be used by the recipient. They can use all or part of the gift certificate. Any amount not used will remain on the gift certificate. They can then use the code again until the amount is depleted. NOTE: The site will automatically generate a code once we accept your order. This will be automatically emailed to you. You can forward it if using as a gift. If you do not receive this email, contact us at orders@ellaslead.com. Please note: Gift certificates are honored forever, so if an old code of yours no longer works, simply contact us with it and we will reset it with the remaining amount. No associated fees, ever.